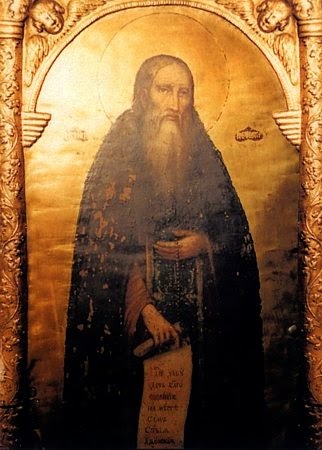 Saint Anthony Pechersky was from the Ukraine. He went to a monastery in Greece and then came back to his home country to start his own monastery. Anthony lived as a hermit. Hermits are people who spend most of their time away from other people so they can focus on Jesus. Most of the time, Anthony lived in a hand-dug cave, where he ate only rye bread every other day and drank only water. People all around the area knew how holy he was, so they came to him for advice, guidance and blessings. Bake (or purchase) some rye bread. Have this bread and water as one of your meals or snacks today. Talk about how living alone with very simple food might help us keep our eyes on Jesus. Below is a rye bread recipe that doesn’t have caraway seeds (which have a licorice-like flavor that most kids find offensive), so it’s easy for children to eat. If you have a bread machine, simply follow the manufacturer’s direction for adding ingredients (either wet ingredients first or dry ingredients first). To be a little more authentic, set the machine on “dough” cycle and then follow directions 5 and 6 below. *If your family is gluten-free, I found a gluten-free Swedish-style rye bread recipe that you can try at the Gluten-Free Goddess website." 1. Combine the rye flour, gluten powder (if using), cocoa powder, brown sugar, salt and yeast in a large mixing bowl. 2. Heat the coffee, oil and molasses in a small saucepan until just warm (115°-120°). Pour the warm mixture over the flour mixture and beat with an electric mixture for three minutes at low speed. Add the wheat flour and half the bread flour and mix with a large spoon. 3. Turn the mixture out onto a heavily floured wooden board and knead in the remaining bread flour until the dough is smooth and elastic (6-8 minutes). 4. Shape into a ball and place in a greased bowl. Turn once and cover with plastic wrap and a tea towel. Let rise in a warm place till double (1 ½ hours). Punch down dough; remove from bowl. 5. Shape the bread into a round loaf and place on a baking sheet covered with greased parchment. Flatten slightly with the palm of your hand, cover and let rise till double (45 minutes). 6. Using a sharp knife, cut a cross into the top of the loaf. Bake at 350 degrees for 40 minutes or until nicely browned. Cool slightly, but serve while still warm. Saint Anthony Pechersky, pray for us!